John Long at Hamburger Mary's. 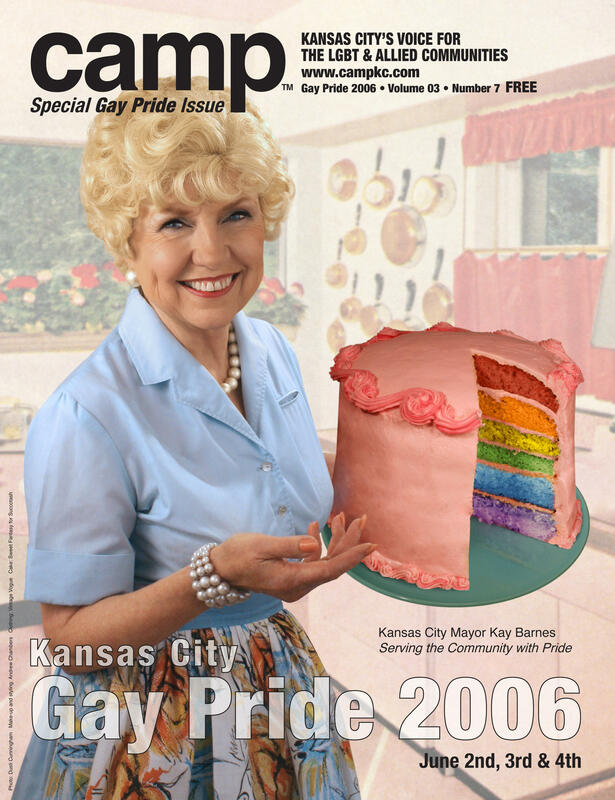 When Kansas City Mayor Kay Barnes came in for her photo shoot for the cover of Camp Magazine, she had no idea that she’d be styled as a 1950s housewife holding a rainbow layer cake. This was in 2006, and the photo was for the Gay Pride issue. According to Camp publisher John Long, the mayor showed up in a pantsuit and her signature flower on her lapel, security guards in tow, and encountered a rack of different outfits, aprons, jewelry and a wig. She did, and an iconic cover was born. Camp Magazine serves the LGBT community and its allies, and it’s known for its unique covers. When the first issue came out over a decade ago, though, it had a totally different look. It resembled a newspaper, with three stories on the front page. Long, who is also the editorial director, wanted it to be a serious magazine. When the publication switched to a tabloid format with a single-image cover, distribution went up. Six years ago, the magazine went smaller, and the readers and advertisers loved the new trim size. Kay Barnes on the June 2006 cover. Getting into the publishing industry had been a longtime dream. 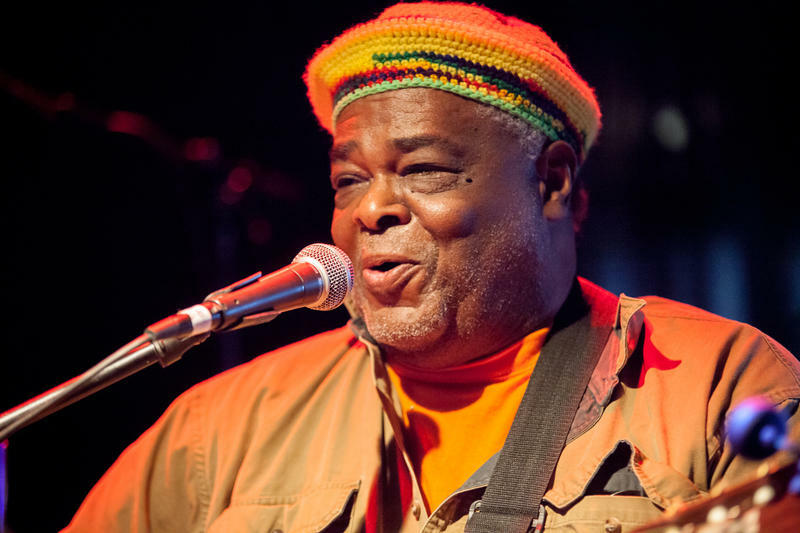 John Long grew up on the southwest side of Chicago. He was one of six kids in an Irish Catholic family. When he was 10 years old, his father died from a heart attack at work, leaving his widow with six kids under 16. As the oldest boy, Long kept hearing that he would have to be the man of the family. 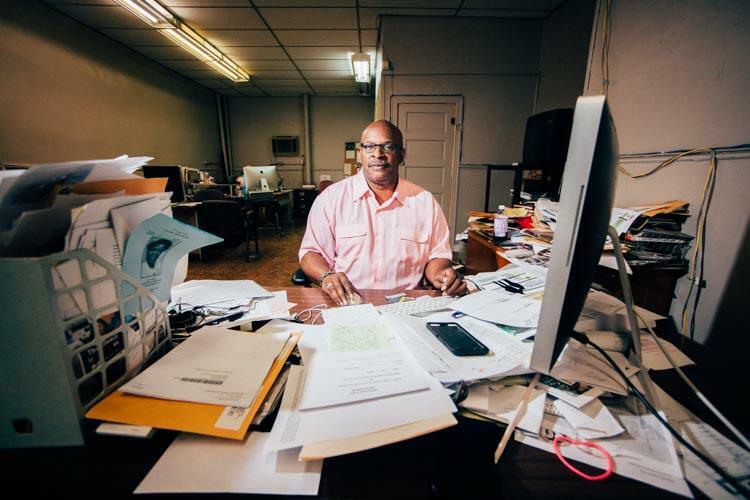 He took two paper routes and a grocery store job and paid his way through his Catholic high school. He describes himself as a loner in high school. He was tall and he didn’t like sports — especially basketball. He heard “what a waste” so often that he started believing it. He also knew that he was different. “It all just spilled out. I sat there and started bawling like a baby,” Long said. The teacher encouraged his love of art by starting an art program just for him. Inspired by his teacher, Long majored in English in college — and, for a time, considered being a brother — before switching his major to journalism. After college, he worked for a floral industry magazine, then took a bartending job at Chicago’s Pump Room. Still determined to get into publishing, he attended the Stanford Publishing Course, a 10-day class for professionals in the book and magazine business. He was eventually hired to be the assistant to the Stanford course’s director. He also came out during this time. After college, he moved to the north side of Chicago and went to his first gay bar. He was astounded by the number of men in suits at the bar; he thought that just a few occupations were open to gay people. However, he says it killed him to be gay in Chicago; he was worried about getting caught by his family, so he moved to San Francisco. He told his family when he was 30. The first person he came out to was his youngest sister, who said that everyone already knew. The tip-offs for his family: He was single in San Francisco, he never talked about women and all his male friends had multi-syllable names — Norman, Christopher and Thomas instead of Norm, Chris and Tom. 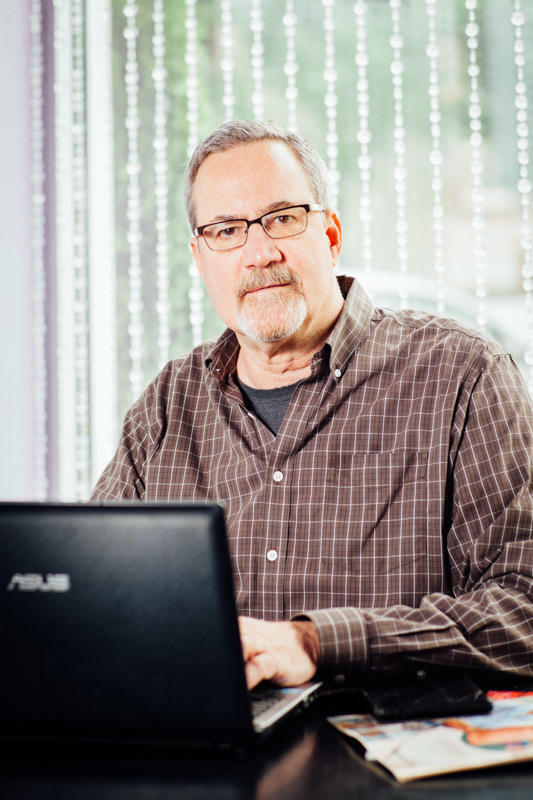 His career path took him from San Francisco to Washington D.C., where he worked at trade magazines and as a consultant. A job offer brought him to Kansas City in 1996. In 2004, he and Jim Gabel, a graphic designer and his then-partner, decided to start a magazine. Long had been writing for the Midwest Times, a local LGBT magazine. When it folded, he and Gabel thought, “Why not? Let’s start one.” They published the first issue in June for Gay Pride weekend. Another popular cover featuring Todd Tramp, rodeo champion. Many of their stories are about allies, he said — friends of the LGBT community. One of the things he’s proud of is that he can walk into a coffee shop and see heterosexuals reading Camp because they’re just as interested in “our lives” as Long is in theirs. Portrait Sessions are intimate conversations with some of the most interesting people in Kansas City. Each conversational portrait is paired with a photographic portrait by Paul Andrews. A New York writer's journey home sheds light on family, keeping secrets, and the state of small-town Missouri. Plus, how one Missouri town might vote itself out of existence. Eric Wesson of The Kansas City Call says that Kansas City's black community is like Ralph Ellison's Invisible Man. "I am a man of substance," wrote Ellison's invisible narrator, "of flesh and bone, fiber and liquids -- I may even be said to possess a mind. I am invisible, understand, simply because people refuse to see me." Wesson read those words for the first time in sixth grade, but didn't relate to them until he was in his 20s, at which point, he said to himself, 'Oh, I get it. We're here, but nobody sees us or pays attention to us.'" The first time Danny Cox visited Kansas City, it was not a pleasant experience. It was 1963, a year before the Civil Rights Act banned racial discrimination in public places, and Cox was a nationally touring musician arriving for a show. When he walked in the door at the Muehelbach Hotel, the clerk told him that black people couldn't stay at the Muehelbach. Though the word he used for "black people" was not quite so polite. Most of Cox's fellow musicians and road crew were white, but they refused to stay in a place where their vocalist wasn't welcome.